Today, when one thinks of naval combat between British and Argentinian forces the Falklands War of 1982 is the case most likely to come to mind. An equally fierce engagement did however occur 137 years earlier and, though it is largely forgotten in Britain today, is commemorated annually in Argentina by a national holiday on each 20th November. The Spanish colonies in South America gained their independence in the 1820s through brutal wars of liberation. Much of the rest of the century thereafter was to be occupied by an almost constant warfare between the new nations – and with the Portuguese-speaking Empire of Brazil – to establish national boundaries. Dictators were to abound in this period, many as savage and ruthless as those who were to be seen in Europe and Africa in the 20th Century. 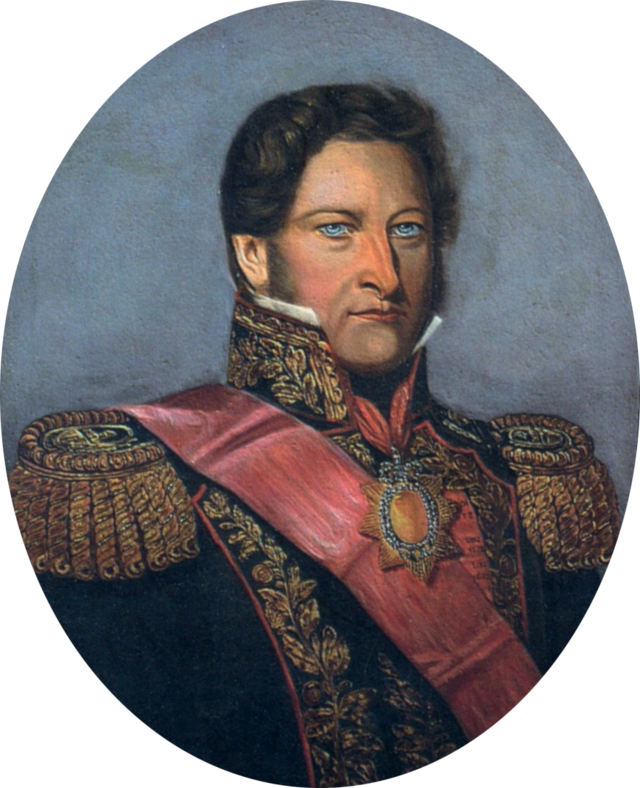 Among the most notable – indeed notorious – of these was the tyrant Juan Manuel de Rosas (1793 –1877) ruled Argentina almost uninterruptedly from 1829 to 1852. The political complexities surrounding war between Argentina and Uruguay in the mid-1840s are impossible to sketch in a short article. British and French interest in the situation focussed on protection of commercial interests in Uruguay and on keeping navigation of the Parana River open to commercial traffic. This huge river, navigable by sea-going vessels of the time for much of its length, leads into the very heart of South America. In mid-1845 Argentina had closed the river by means of a boom and shore batteries at La Vuelta de Obligado, some 120 mile NNW of Buenos Aires. At this point the river is 700 metres wide and a tight turn (vuelta in Spanish) makes navigation difficult. British merchant shipping was trapped upstream and other ships, 92 in total, carrying manufactured goods, were unable to move upstream. At this period of British commercial dominance the challenge was irresistible, as it also was for the French. 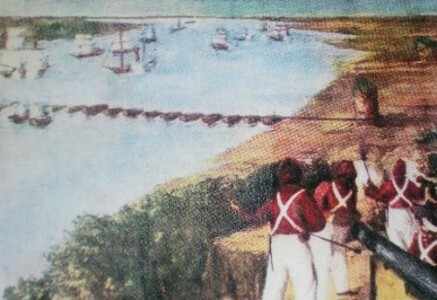 The Argentine boom extended completely across the river and consisted of 24 vessels linked by three strong metal chains. Only three of these vessels were Argentinian naval units and the remainder were requisitioned. Four artillery batteries with 30 cannons in total, a mix of 8, 10, 12 and 20-pounders, were dug in on a cliff that rose from 100 to 600 feet on the southern bank, and supported by some 2,000 entrenched troops. A small brigantine, the Republicano, and two small gunboats, the Restaurador and the Lagos, were also available to protect the boom. 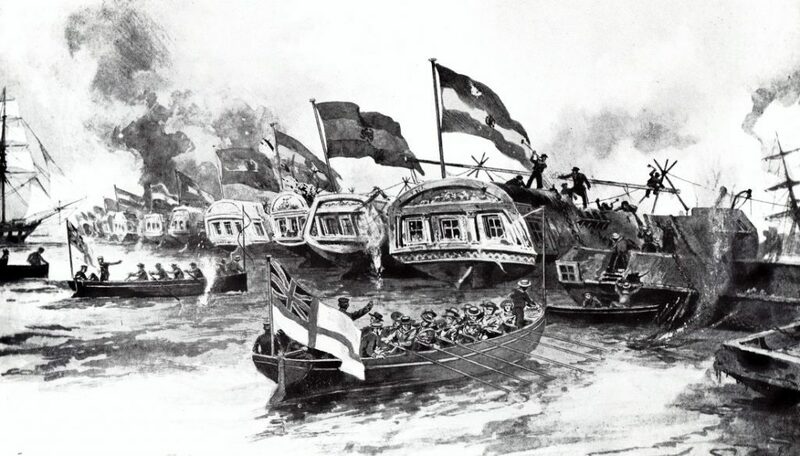 The combined British-French force that moved upriver totalled eleven warships, six of them of the Royal Navy. Eight of the vessels were sailing craft but the most powerful were three steam paddlers: HMS Gorgon, HMS Firebrand and the French Fulton. Steam power in warfare still a novelty and these vessels represented contemporary cutting-edge technology. The Gorgon, which had already seen action in the bombardment of Acre in 1840, can be considered representative of the type. Of wooden construction and of 1,610 tons, she was classed as a sloop. Her length was 152 feet along the keel and her 800 hp 2-cylinder direct-acting steam engine drove two enormous 27 foot diameter paddle wheels – and obvious point of vulnerability in battle. Though capable of 9.5 knots under steam considerations of coal supply demanded that she also carry an auxiliary sailing rig. Her armament was impressive for her size – two pivot-mounted 10-inch guns, two 68-pounders and two 42-pounder carronades. 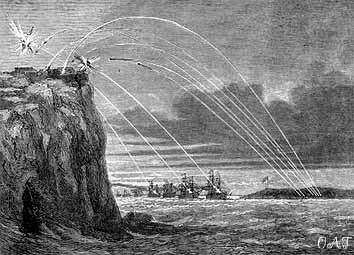 In addition the British ships carried Congreave rockets, probably 24-pounders, which, due to their high trajectories, were to prove very useful for attacking the Argentinian positions on the cliffs. 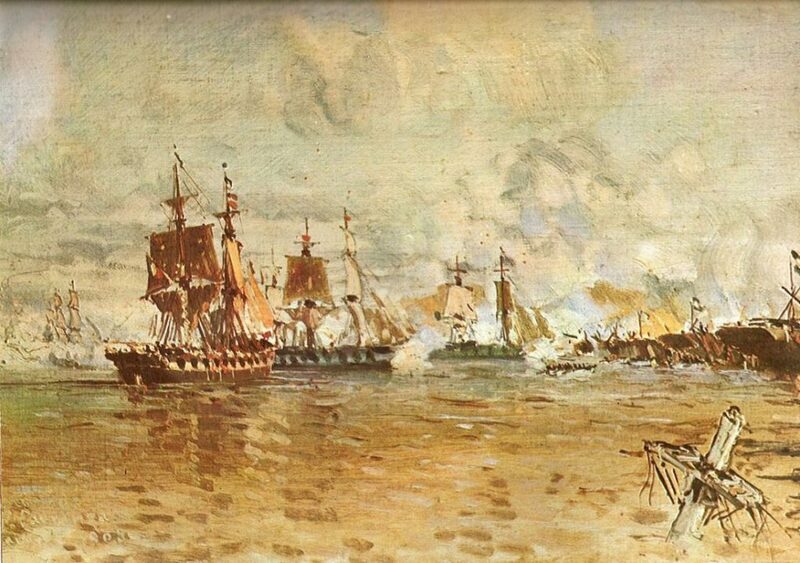 The battle commenced early on November 20th, with an intense bombardment by the British and French ships of the outgunned Argentinian defences. The wind was light, making handling of the British and French sailing vessels difficult and they were to suffer under fire of the batteries. The three steamers now came into their own, not only since they were heavily armed, but because of their manoeuvrability and non-dependence on wind. Heavy casualties — 150 dead, 90 wounded – were inflicted on the Argentinian defenders. The boom remained however intact and heavily defended, and gunfire alone was unlikely to part the chains linking the vessels it consisted of. What followed had much about it of a “cutting out” expedition of the Nelsonian and Napoleonic period. Captain James Hope of HMS Firebrand volunteered to cut the boom. Taking three boats with him, and under heavy fire, he managed to board at the centre of the boom. Armourers accompanied the bluejackets and in some four minutes the chains had been severed, allowing the allied ships to push upriver. They were now in a position to rake the shore batteries with impunity. Disembarked troops overcame the last defenders of the bluff, and 21 cannons were captured. The Argentinian Republicano was blown up by her own commander when he was unable to defend it any longer but the gunboats Restaurador and Lagos disengaged successfully and withdrew up river. The combined British and French force had lost 28 dead and 95 wounded. The river was now open to commercial traffic, its safety guaranteed by the allied ships. One of the British vessels, the brig HMS Philomel, advanced to a point 800 miles from the sea, under the command of Commander Bartholomew Sulivan. The voyage was a triumph of skilful seamanship, progress hampered at times by contrary winds, a three or four knot current, and shallow sections with as little as a foot of water beneath the keel. 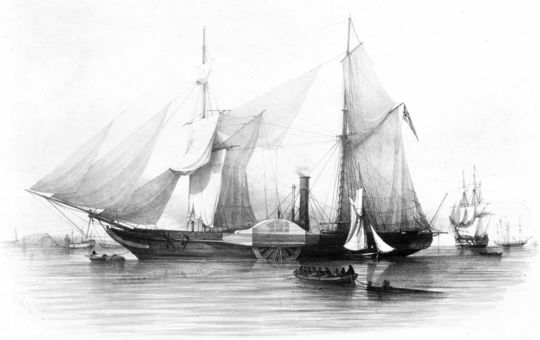 Sulivan, who had served on HMS Beagle during her momentous voyage, was subsequently to emerge as the Royal Navy’s most noted hydrographer and to end his career as an admiral. 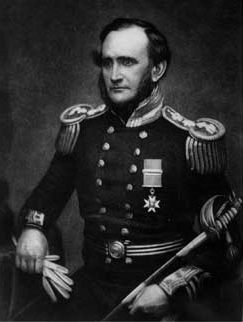 Captain Hope also achieved flag rank, his promotions culminating in Admiral of the Fleet in 1879. The Obligado victory did not however end the British and French confrontation with Argentina. A five-year long blockade was to close Buenos Aires to maritime commerce. The stand-off was ended by treaties signed in 1849 by Britain and in 1850 by France and acknowledging the Argentine sovereignty over its rivers. The French took particular pride in their contribution and a Paris Métro station remained named after the battle until 1947. When Eva Perón came to visit the name was however judged undiplomatic and the station was renamed “Argentine” and has remained so since! And what became of the dictator, Rosas? He was to rule Argentina for another seven years, finally fleeing into exile after defeat in a war with Brazil. 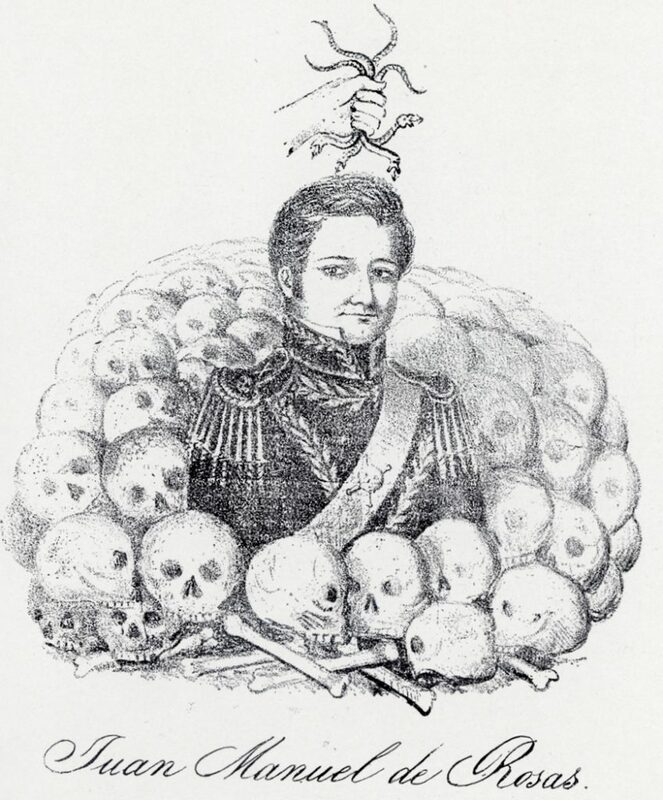 He settled – surprisingly – in England, and appears to have lived quietly thereafter, dying at Southampton in 1877. Dictators have met worse fates.